This is one of those sets which you enjoy from first to last, conscious of the fact that you are in the presence of interpretative mastery that will never, ever be preserved on the gramophone again. 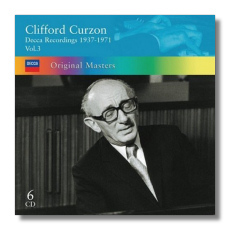 Clifford Curzon was one of those unique pianists who could transform a classic work into a highly emotional and intense experience and this is the case in almost all the works recorded here. The first disc begins with an orchestral arrangement by Liszt of Schubert's 'Wanderer' Fantasy that is played with great zest by Curzon and accompanied with even greater zest by Sir Henry Wood and the legendary Queen's Hall Orchestra. Dating back to 1937, this is an ancient recording but which still comes up excellently in this new digital transfer. The accompanying Piano Quartets by Mozart also find Curzon in fine fettle whilst the Amadeus Quartet's accompaniment is indeed radiant especially in K. 493. A sextet of concertos then follows on the next three CDs. Much has already been said on the legendary recording of Grieg's Piano Concerto with Oivin Fjeldstad and similar accolades have been heaped on the Second Brahms Piano Concerto with Knappertsbusch and both make a welcome return to the catalogue in this set. Brahms' First Concerto is represented by an earlier recording with Enrique Jorda from 1946 and previously available on the Dutton Concert Classics label, a rushed job sometimes but certainly very desirable. The Mozart #23 dates from a similar source but here I must indicate my clear preference for Curzon's later recording with Benjamin Britten, previously available on the Decca Legends label. The Rachmaninoff Second is another classic of the gramophone and is beautifully done with Sir Adrian Boult providing masterful accompaniment throughout. The same could be said for Tchaikovsky's First Piano Concerto with Sir Georg Solti, although this is slightly more of a whirlwind interpretation. The recordings made in the mid to late 50's are outstanding. Finally, we have two discs celebrating Curzon the soloist in Liszt, Schubert and Schumann. The Piano Sonata in B minor comes to life like nothing else whilst the Liebestraum #3 is another wonderful interpretation. The Schubert Impromptus are also quite magical whilst the 'Eroica' Variations make an apt conclusion to this magnificent set that continues the Curzon legend like its two preceding volumes.